The original HYPE is a dark pink-colored beverage that claims to be one of the best tasting energy drinks, with a smooth and not too-sweet taste "designed for the more mature and discerning energy drink user". The company feels it we has cutting edge leaders (not followers) as consumers. Hype contains the expected caffeine, as well as vitamins and fruit juices such as real elderberry and cranberry juices. It comes in a diet version (Hype Lite) that has the same caffeine level, but is lower in calories (about 25 Calories per can). 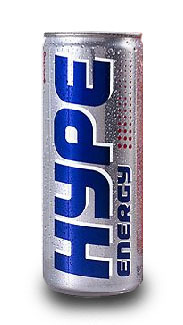 Hype X2 is the same drink as Hype but served in a 16oz (500ml) can and contains 160mg of caffeine. The latest addition is Hype MFP, which contains guarana and ginseng and lacks the pink color of the original. It is marketed with more of an "edge", and comes in a black can. The Hype website offers screen savers, ring tones, and retro-style Flash games.